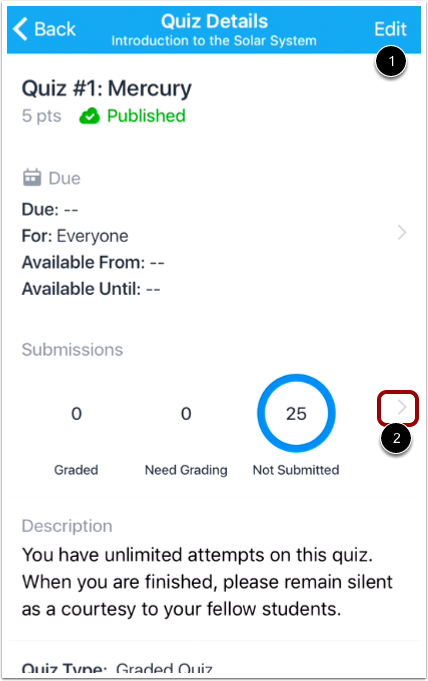 How do I view Quizzes in the Teacher app on my iOS device? 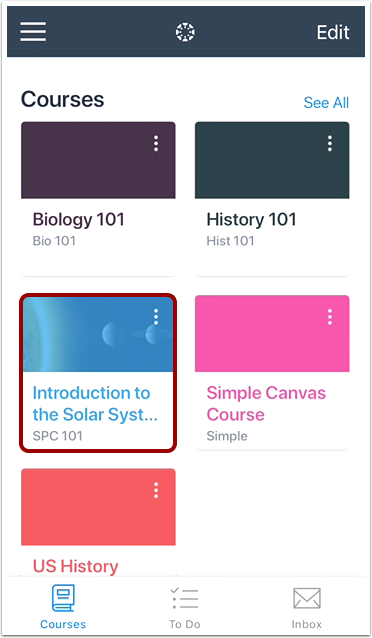 Canvas lets you view Quizzes from your mobile device. 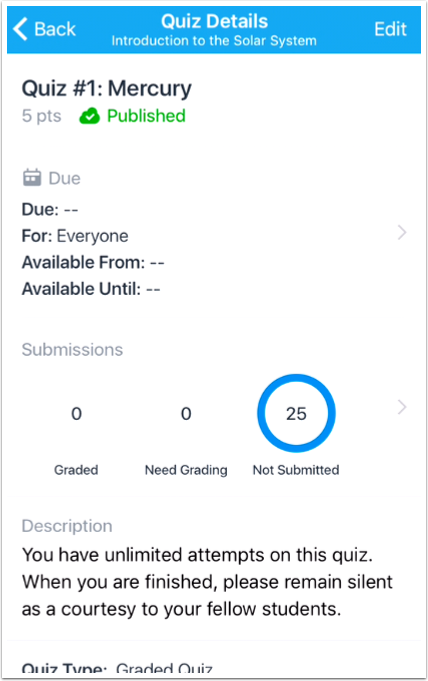 For each quiz, you can view the details of the quiz including the due date, points, number of questions, the time limit, and number of allowed attempts. 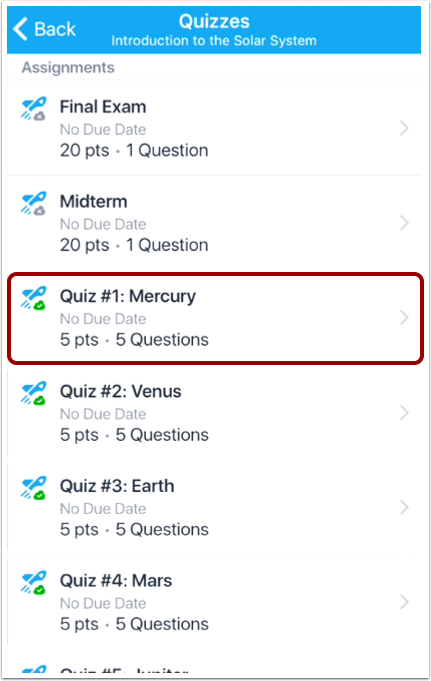 Canvas natively supports quizzes that contain Essay, Multiple Choice, Multiple Answer, Fill in the Blank, Matching, Numeric, or True/False questions. Any quizzes that do not contain supported question types are redirected to the web version of Canvas. Additionally, currently the app does not support one-question-at-a-time quizzes, quizzes with passcode restrictions, or quizzes with IP address restrictions. 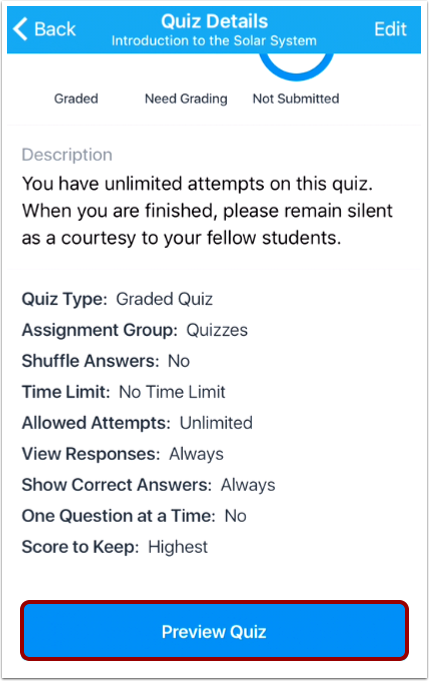 Note: Quiz questions cannot be edited in the Teacher app. Quizzes are organized by assignment group and due date. To view a quiz, tap the name of the quiz. 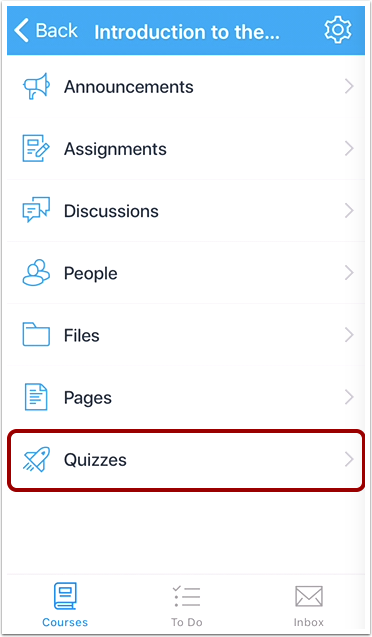 For each quiz, you can view all the details for the quiz including the title, points, display grade, quiz type, due date, and quiz details. To edit the quiz details, tap the Edit link . You can manage all quiz options as well as due and availability dates. To view submissions for the quiz, tap the Submissions link . To preview the quiz, scroll to the bottom of the quiz details and tap the Preview Quiz button. Depending on the type of quiz, you may be directed to the web version of Canvas. Previous Topic:How do I view context cards in the Teacher app on my iOS device? Next Topic:How do I use the Rich Content Editor in the Teacher app on my iOS device? Table of Contents > Courses > How do I view Quizzes in the Teacher app on my iOS device?